OSWEGO, NY – The Oswego High School Jazz Ensembles will be presenting their annual “Evening of Big Band Jazz” this Friday in the Oswego High School Robinson-Faust Theatre for the Performing Arts at 7 p.m.
Defren noted this is a free concert and usually a full house attends the annual event which also features the graduating seniors. A world-class jazz musician, Martin has released twelve albums as either leader, or co-leader. These albums showcase his dazzling improvisation alongside other top jazz artists such as the late Carl Fontana, Pete Christlieb, Bobby Shew, and Eric Marienthal. He has also collaborated as a sideman with jazz greats such as Stanley Turrentine and Horace Silver. He had a long association with British bandleader and jazz promoter Vic Lewis, and was the featured soloist on many of Vic’s CDs. Additionally, he is well-known for his work as a lead player and featured soloist with virtually every big band in L.A. Most notably, he is the lead trombonist and featured soloist with Gordon Goodwin’s Big Phat Band. 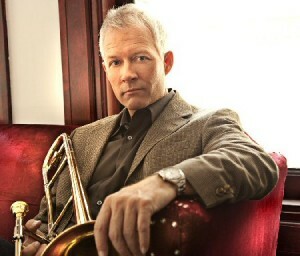 He is also the lead trombonist and soloist for The Tom Kubis Band and soloist for the Bill Holman Big Band. He has also appeared in bands led by Jack Sheldon, Louis Bellson, Quincy Jones, Matt Cattingub, Bob Curnow, Patrick Williams, and Sammy Nestico, among others. Andy was also the trombonist for Poncho Sanchez for two years. Martin has long been one of L.A.’s first call trombonists for commercial recordings, television and motion pictures and live theater. He has contributed on albums for many popular artists, including the Pussycat Dolls, Coldplay, and Michael Buble. His television credits include every major awards show: the Grammys, the Emmys, the Academy Awards, the Golden Globes and the Screen Actors Guild Awards. His first influence was his father, music educator and trumpeter David Martin. He also owes much to his teachers and outstanding fellow musicians Charlie Shoemake, Robert Simmergren and Roy Main. As an instructor himself, he has influenced countless young players. He has appeared at many colleges and universities throughout the country as a guest artist and clinician.